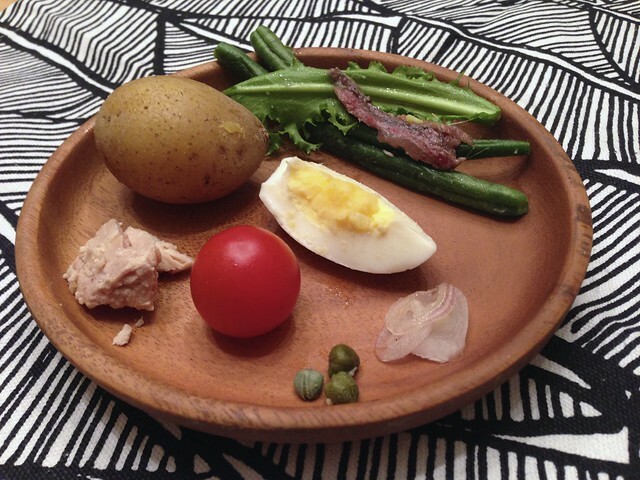 There’s a lesson, as usual, in today’s French Fridays with Dorie recipe, salade Niçoise. You don’t mess with classics. Take for example Pride and Prejudice. The book itself is a classic. It has spawned a quasi-classic BBC mini-series, inspired a funny modern quasi-classic romantic comedy (Bridget Jones’ Diary), and is still one of the most read books in the world. Did the world really need Pride and Prejudice and Zombies? The countless fanfic written straight for the Kindle? Pop culture right now leads us to incorporating otherworldly creatures, alternate realities (seriously, The Other Mr. Darcy?) into well known and loved stories. I understand that people love the original so much and they want to tap into all the possibilities within that story. Just don’t name it Proud and Prejudiced, or Dashing From/To Darcy or something equally lame. Salade Niçoise is really no different. Fresh tuna? Yes, I admit I considered it. Marinated artichokes? Not really out place. Sundried tomatoes are such a nice counterpart to briny olives and capers. Croutons, #sexybacon, dried cranberries, and an asparagus spear are the zombie threatening to show up and eat up the classic salad‘s brains. It’s just too easy to get carried away. I’m happy I didn’t yesterday. Truth be told, that had more to do my poor planning/attempts to squeeze in this post on time. If I had had the time to defrost and cook a tuna steak, you would have seen the seared tuna slices fanned over the rest of the ingredients. On a side note, I bought a three years supply of capers at the warehouse club on a whim. 32 ounces for less than six dollars! The tiny jar in the supermarket costs at least two. Short of making this salad on a weekly basis, what are your favorite recipes that have capers on them? Feel free to link back in the comments! French Fridays with Dorie is an online cooking group where a group of fearless bloggers take on a recipe from Dorie Greenspan’s Around My French Table on a weekly basis. Click here to see their versions of Salade Niçoise. I love capers with lox! Especially on a cream cheese bagel! Seared tuna is a great idea! I might try that next time if I can remember, LOL! I had a rough enough time with just the basic ingredients! I love your plate of just the elements 😉 What a great idea! Love Pride & Prejudice – there should never be a zombie version. That is just wrong…. A movie version of PP&Z has been in the works for a while per IMDB. I read the first chapter. Definitely not for me! Thank you for the link to the HuffPost’s recipe gallery. Didn’t the olive sablés have a little bit of capers in them? PS – Wouldn’t you know it? Pinterest has a Capers Board. What a wonderful world…….. Perfection here, Adriana…and I love mine with rare Ahi slices, too 🙂 I’m seeing snow flurries in Denver where I’m visiting…may skip my flight back to Indy and join Mary in visiting you in PR! Love this. You don’t need to mess with a classic just for the sake of messing with it. As for the abundance of capers dear… chop up 2T and add to your ground turkey with 2 T of Worcestershire sauce and minced green onion for delicious turkey burgers. Same recipe for beef too but beef needs less help. Chicken or veal picatta is delicious, and uses a bunch of capers. I havent tried this version, but it takes 1/4 cup of capers. That’ll make a dent! I’ve been meaning to make some picatta for a while now. Thanks Eileen! Ah see now – what is a REAL Salade Niçoise? Who knew this post would open up a can of worms over on my blog? My jar of capers at 65gm cost me RM5.80 and I do love them. My fav dish regards capers was ox tongue, mash potato and capers sauce! yumms! The ingredient list for this salad in ‘A Little Taste of France’ has all the components of Dorie’s so its as classic as it gets! Ox tongue! My husband’s grandfather used to make braised tongue for the family. That’s one of E’s favorite food memories growing up. Don’t fret about the capers send them over to me. I put them in everything from salads to pasta,, to more pasta, on top of lemony sole, etc,, etc. Enjoy those bursts of salt. When I was in graduate school for literature, deconstructionism was all the rage, and it is French… see it all connects… or unravels if you are deconstructing… OK, but we were talking about salad? Glad you enjoyed it. LOL – I am not sure what to do with all of those capers!! My last tiny jar of capers dried out so I am no use whatsoever with suggestions on how to use them. This was a great salad. great, I love the potatoes in this one. I have one of those huge jars of capers, too. They’ll last me for years. Fortunately, since they’re brined, I think they should last indefinitely. 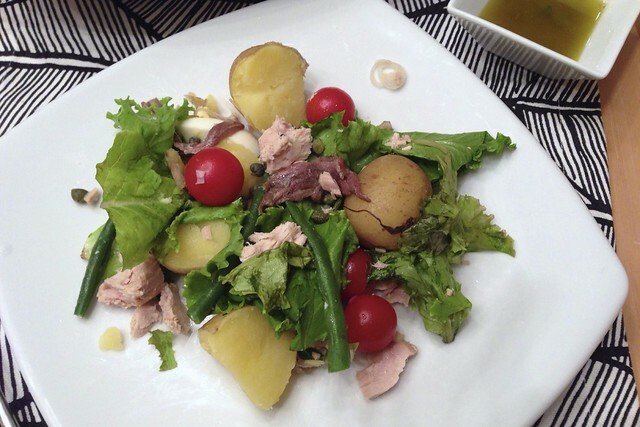 Salad nicoise is a favorite salad in my house…I’ve actually made a few different versions.Yours looks so pretty! Wanted to tell you again how much I enjoyed meeting you and Edwardo! It was a fabulous weekend. Looks like you enjoyed the rest of your trip, also! Have a great weekend! Adriana, a very lovely deconstructed presentation of this classic French salad – beautifully arranged and worth many repeats, I am sure! It is wonderful to read that you enjoyed this fabulous salad! I agree. Things are classic for a reason. They really don’t need to be messed with!